More people are being attracted to Birmingham’s ever-changing city centre due to the number of regeneration projects currently under construction. This has resulted in the number of amenities in the area increasing which makes living in the city centre more appealing. The population of Birmingham has grown by a staggering 162% from 2002 to 2015, which is seven times faster than the growth of London during the same period. In 2015 alone, 6,030 people relocated from London to Birmingham as a result of affordable housing and excellent transportation links, with London currently just over an hour train journey. The growth spurt in Birmingham city centre has mainly been driven by the younger population, due to the five universities and attractive job opportunities. Last year Birmingham exceeded the average office take-up with some major business relocating from London to Birmingham city centre. With more businesses comes more job opportunities which has resulted in graduates studying in Birmingham staying in the city after finishing their studies. The increase in population has reflected on the demand for property in Birmingham city centre. This has seen an increase in property prices and rental values, with an approximate increase of £100 per square foot by 2020. 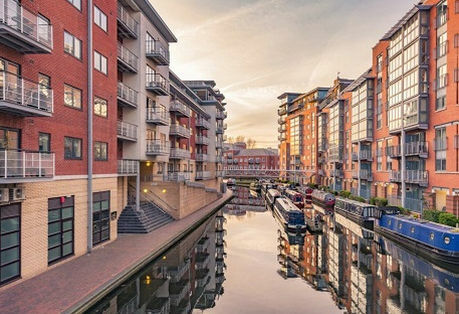 Developers have started to look at areas outside of London with many flocking to Birmingham due to the high demand for accommodation within the city centre. Currently there is approximately 21,200 residential units in planning or under construction in Birmingham. On average the residential values in Birmingham have risen by 31% over the last 5 years with predictions of a further increase of 20 to 30% over the next 4 years. Meaning, now is an opportune time to consider making an investment in Birmingham. Birmingham’s Big City Plan is a 20-year vision set to transform Birmingham and unlock its true potential. Major Businesses have already started moving to the city to take full advantage of the renovation works. Last year Birmingham’s office take-up exceeded a staggering 1 million square feet, which is 51% above the average. Birmingham is home to one of the youngest populations in Europe with 40% of the population 25 or younger. This is due to 49% of graduates staying in Birmingham after qualifying due to more businesses moving to the city and the new HS2 links which will cut commuting times by half. Birmingham New Street is now the busiest train station outside of London with passenger capacity continuing to increase. Alongside the new HS2 transport links, Birmingham has also plugged extra investment into the Metro Network to connect surrounding areas to the city centre. HS2 links will see rail times halved and train frequency increased, which will have multiple benefits for those living and / or working in the city as they will have quick and easy access to Birmingham and neighbouring cities. Traveling from Birmingham to London will be reduced to just 49 minutes, not to mention the number of trains an hour doubling. To find out about the property investments Hopwood House have to offer in Birmingham email enquiries@hopwoodhouse.com or call +44 (0) 161 337 3890.